Although the impact of the Great War on Brighton was profound, the town was spared any direct attack by the enemy. The fear of spies and sabotage, however, was widespread at first and aliens were an issue which had to be swiftly resolved under new legislation. Allies, of course, were warmly welcomed, and accommodation was swiftly found for those fleeing the catastrophic events in Belgium. 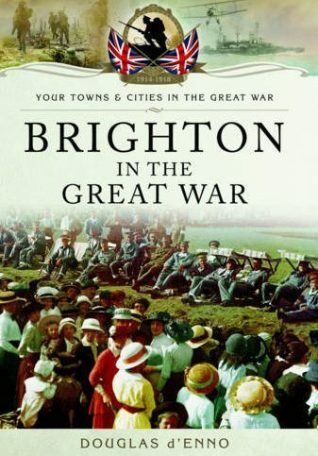 Between 1914 and 1918, Brighton made major contributions to the war effort in many ways: by responding readily to the call to arms, by caring for great numbers of wounded (the story of the exotic Royal Pavilion being used as a hospital for Indian casualties is widely known locally) and by simply being itself – an open and welcoming resort that offered sanctuary, respite and entertainment to besieged Londoners and to other visitors, from every stratum of society. The book looks at the fascinating wartime roles of Brighton’s women, who quietly played a vital part in transport services, industrial output and food production. Non-combatant menfolk also kept the wheels turning under very trying circumstances. When the meat shortage became acute, the mayor himself took direct action, requisitioning ninety sheep at Brighton Station for the town which were destined for butchers’ shops in London. The names of no fewer than 2,597 men and three women who made the supreme sacrifice were inscribed on the town’s memorial, which was unveiled at the Old Steine on 7 October 1922 by Earl Beatty. At the ceremony, the earl acknowledged that ‘it was by duty and self-sacrifice that the war was won.’ It remained, he said, for those who had survived the conflict to ensure that the great sacrifices of the past, both by the dead and the living, should not have been made in vain. We remember them in this book.